BetaNYC advocates for a smarter government while building programs, prototypes, and applications. Below are a listing of apps and tools our community is or has supported. Over the years, we’ve collected quite a bit of research on how to make NYC’s open data more accessible. Through our partnerships, we’ve been able to demystify data terms, values, and how to use open data for collective action. All of our teaching materials are under Creative Commons — check them out here. AHV Dashboard – ALPHA – The After Hours Variance Dashboard is a tool to track the effect of after-hours variances in New York City community districts. The tool empowers community boards and district offices to advocate for better quality of life conditions in their districts. 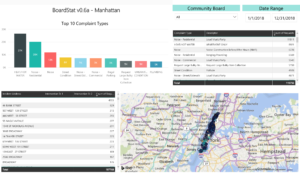 BoardStat – BETA – a highly interactive tool for community boards that empowers users to discover issues and trends within their district’s boundaries. BoardTrack – BETA – is a community board attendance tracking tool and data standard that helps community board staff submit attendance records to a Borough President’s community board liaisons. In turn, liaisons can quickly analyze attendance history. The NYC Boundaries Map – BETA – is a tool for viewing and querying overlapping administrative boundaries in NYC. Various governmental bodies at the city, state, and federal level divide NYC’s geography into a series of districts. 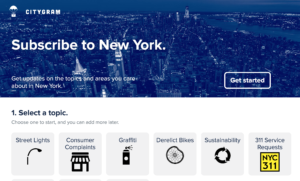 CityGram.NYC – BETA – a notifications platform for subscribing to your city, whether it’s consumer complaints, 311 service requests, vehicle collisions, or restaurant inspections in your area — sign up to find out about the things that matter to you where they matter to you. 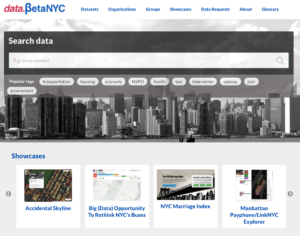 Data.Beta.NYC – BETA – This is a community data portal. If you scrape data and want to share it, please upload it. 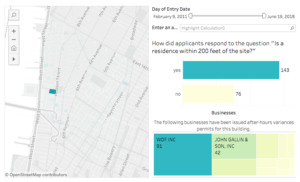 SLA Mapper (SLAM) – BETA – is a tool that aggregates data that community boards often have to gather in order to review liquor license applications and sidewalk cafe applications. Displaying this information in a unified view saves community boards considerable time and resources. 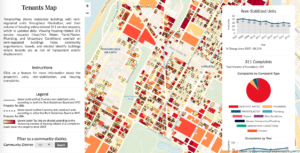 TenantsMap shows residential buildings with rent-regulated units throughout Manhattan, and their volume of housing safety-related 311 service requests, which is updated daily. Viewing housing-related 311 service requests (Heat/Hot Water, Paint/Plaster, Plumbing, and Unsanitary Conditions) overlaid on rent-regulated buildings helps community organizations, boards, and elected identify buildings where tenants are at risk of harassment and/or displacement.